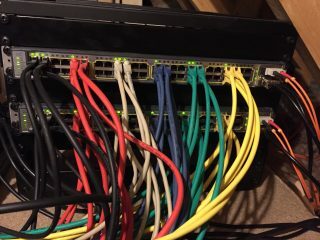 I purchased a pair of Cisco Catalyst WS-C3750E-48PD-EF switches and also a pair of Cisco StackWise CAB-STACK-50CM cables which enables me to have a redundant 64Gbps stack link between the 2 switches both of these switches came with the Catalyst 3750-E 1150WAC power supplies C3K-PWR-1150WAC which are designed for delivery high wattage to PoE devices so I replaced them with the Catalyst 3750-E/3560-E 265WAC power supplies C3K-PWR-265WAC which makes a huge difference not only to the electricity bill but also the heat and noise produced. In the uplink ports at the end I installed a pair of the Cisco TwinGig Converter Modules CVR-X2-SFP which provides me with an additional 4 x 1 Gbit ethernet ports, which I currently have my Synology DiskStation DS1813+ connected to, I also installed a pair of the Cisco 10GBASE-SR X2 Modules X2-10GB-SR which provides me with 2 x 10 Gbit ethernet fibre SC ports which I use to connect from my home lab stack to my house stack which is located in another part of the house. I have 8 x 1 Gbit ethernet ports in each room of my house mainly for connection to media devices, e.g. 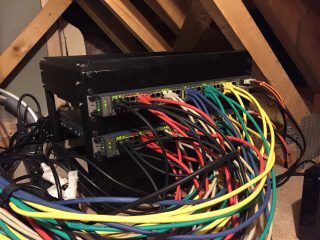 TV, blu-ray, apple tv, roku, amazon tv, control4 and cisco voip phones, these all connect back to another pair of Cisco Catalyst WS-C3750E-48PD-EF switches and also a pair of Cisco StackWise CAB-STACK-50CM cables which enables me to have a redundant 64Gbps stack link between the 2 switches both of these switches came with the Catalyst 3750-E 1150WAC power supplies C3K-PWR-1150WAC which are designed for delivery high wattage to PoE devices. In the uplink ports at the end I installed a pair of the Cisco 10GBASE-SR X2 Modules X2-10GB-SR in each switch which provides me with 4 x 10 Gbit ethernet fibre SC ports which I use to connect from my house stack to my home lab stack which is located in another part of the house. This means that there are 2 x 10 Gbit ethernet fibre SC ports which are unused. My future plan is to purchase another Cisco Catalyst WS-C3750E-24PD-EF switch which I will connect back to the house stack via a pair of Cisco 10GBASE-SR X2 Modules X2-10GB-SR which provides me with 2 x 10 Gbit ethernet fibre SC ports this switch will purely be used to connect up all the home cinema equipment that I have. 990 days, 13 hrs and 8 min.